Most people think that drawing involves a great deal of artistic talent and skill. 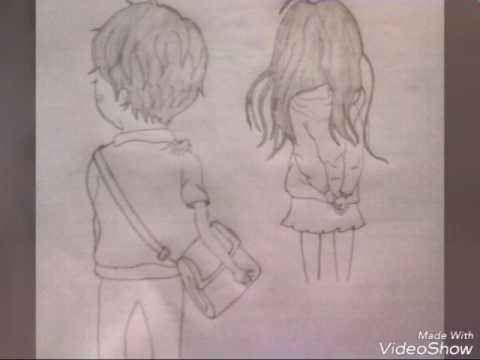 However, there are many forms of drawing that can be learned and that can be done by amateur artists. 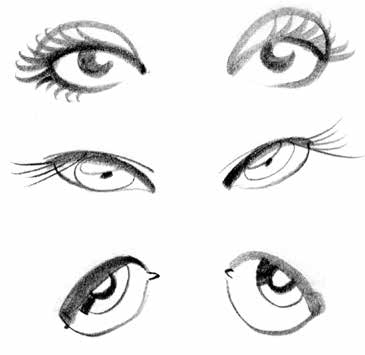 Cartoon eyes are an example of that, as it is quite simple to draw different styles of cartoon eyes. 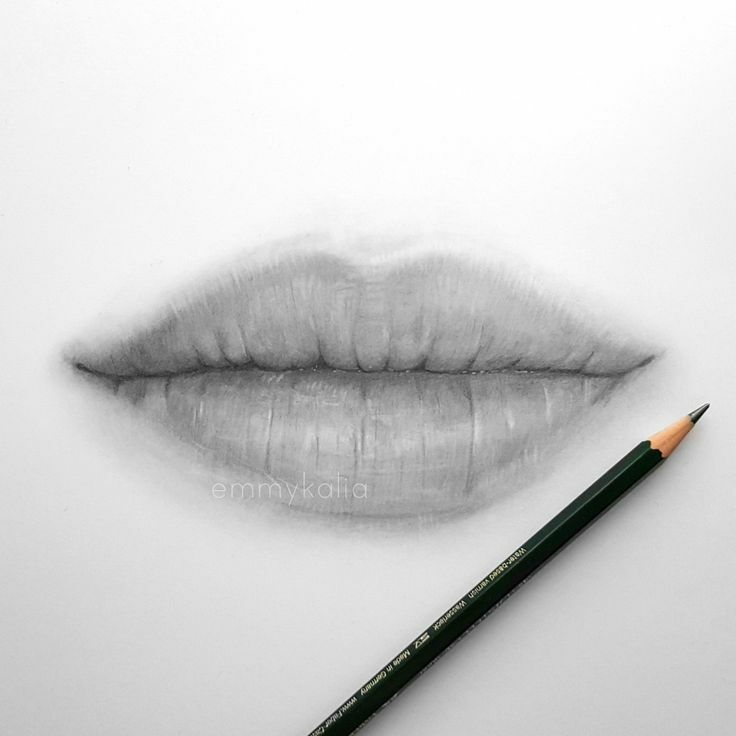 They require less detail and only a few strokes of the pen or pencil to create. Use a ruler to draw a cross in the middle of the circle. The cross splits the circle into four quadrants, which will help you position the eyes for the cartoon. 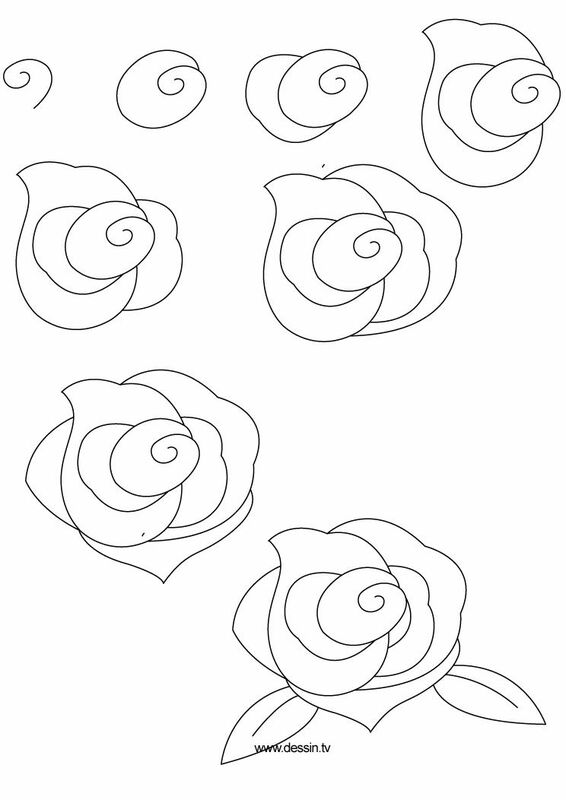 Draw the lines as close to the middle from top-to-bottom and side-to-side as you can. This will help ensure that your eyes are placed evenly and at an equal distance from each other. Decide where you want the eyes to sit on the character’s face. They can be placed anywhere on the face, but you have to add other features, as well. If they sit higher on the face, you might have to make them smaller or make the eyebrows smaller. However, this could lend to an emotion like surprise or fright, where the eyebrows “disappear” high on the forehead. In most cases, you will likely want the eyes to be an even distance apart from each other, as well as level with each other horizontally. Color the iris around the pupil with your preferred hue. 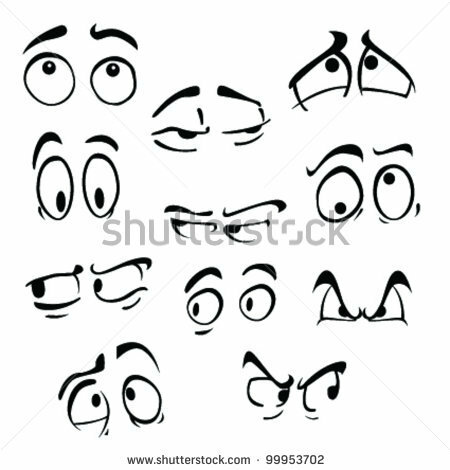 Keep in mind the emotion that you are trying to convey with your cartoon character’s eyes. 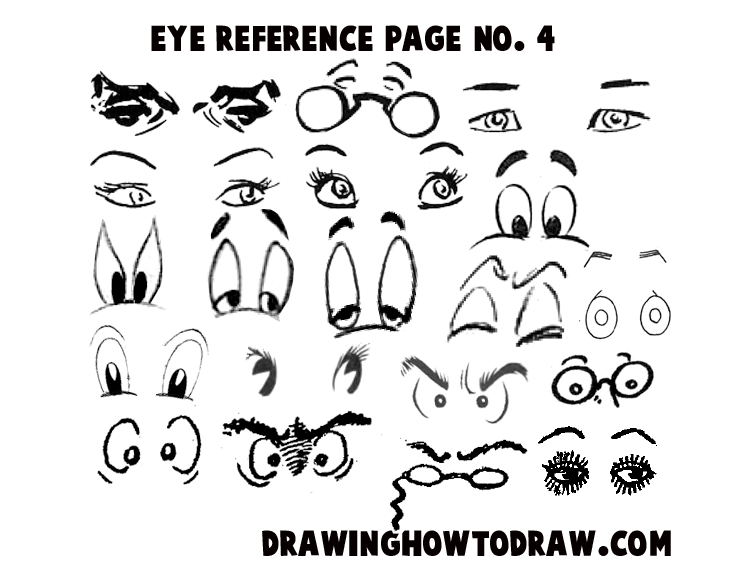 The thickness of the iris helps your audience better understand how your cartoon character feels. The color that you choose for the iris can also help to convey an emotion. 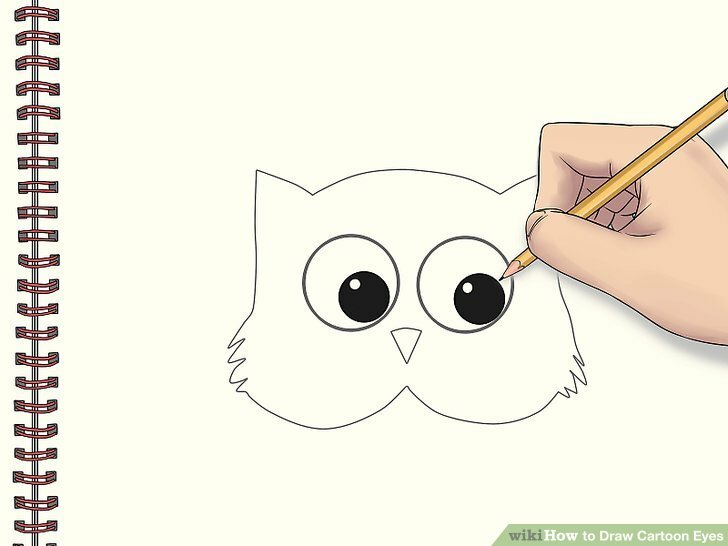 Or, the color can simply demonstrate your unique creativity and the embodiment of what you envision your cartoon to look like. Color the iris around the pupil with whatever hue you like for the character. Remember to make your iris thicker or thinner based on the emotion you want your cartoon face to convey to your audience. If you are going for a flirty, feminine character with this eye shape, then it could be fun to use colors such as purple or pink for the iris. Colored pencils are the most useful tool for this type of coloring, as you can sharpen their tips to keep the coloring crisp and neat. Add eyelashes and eyebrows. It is up to you how you draw these characteristics, as it will depend on whether your character is male or female. Shade in the top edge of the oval to be a thick line that tapers at either edge to demonstrate more masculine eyelashes. Draw wispy eyelashes from the top of the oval to demonstrate more feminine eyelashes. You might still want to add in the tapered shading mentioned above to give the appearance of makeup. Only add a few thick eyelashes to make the eyes and face look very rudimentary and simple. Shade in the eyebrows to a style of your liking. You can make them thick and bushy for a male or slender and arched for a female. You can also play around with the emotions of the eyebrows, making them angry, surprised, shocked, worried, et cetera. Add eyelashes to the eyes and eyebrows to the forehead. It is up to you how you shade in these characteristics, as it will depend on whether your character is male or female. For female cartoon characters with this eye shape, it is common to place eyelashes only on the outer edges of the top eyelids. This gives off a flirty, feminine vibe. 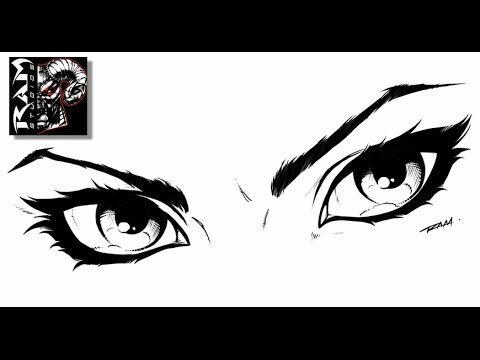 Keep in mind that you want to match the shape of your character’s eyebrows to his/her emotion. With more emotions available with this particular eye-shape, you must take care to match the two together. Color the iris around the pupil. This will give your character a little more life and realism. Common colors for eyes include blue, green, brown, gray, and hazel. However, you can get creative with your cartoon and use other colors, such as purple, orange, or red. Depending on the size you made your pupils, you can make the iris thicker or thinner. 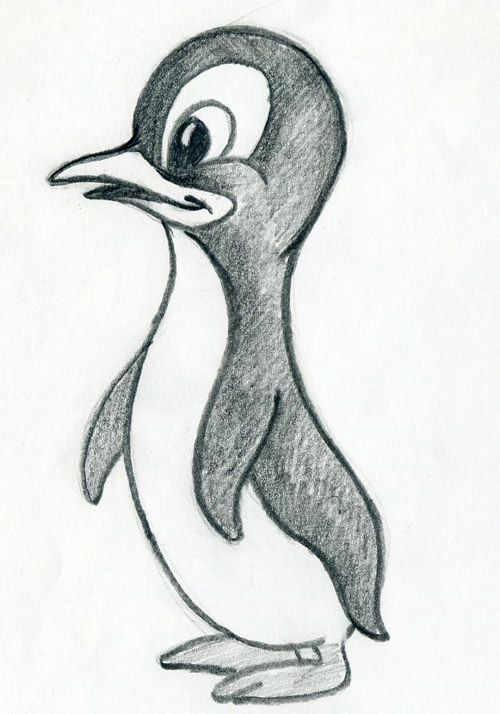 The size of the pupil indicates the emotion of the character, i.e. 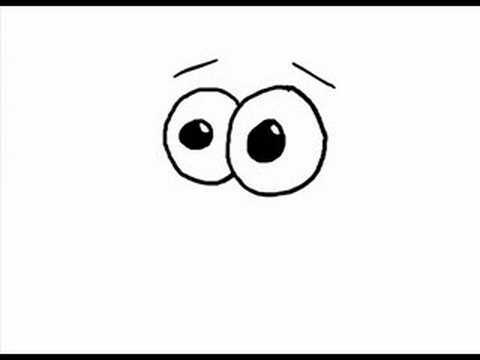 if the character is scared, then his/her pupils will be larger, showing less iris. Draw two almond-shaped eyes on your face, using the cross as your guide for placement. Almonds are typically wider on one end than they are on the other. For cartoon eyes with this shape, typically the wider end is placed on the inner part of the eye, close to where the nose will be. Sometimes the wide end is exaggerated, making the inner part of the eye very large, while the outer part of the eye tapers down to a small point. This is good for conveying concepts or emotions like innocence, surprise, and youth. Almond-shaped eyes are often used for female cartoon characters to create the ideal of beauty and femininity. Shade pupils into the circles, in a place that makes sense. Almond-shaped eyes convey a slightly different set of emotions from the other two methods above, and they are more human-like. 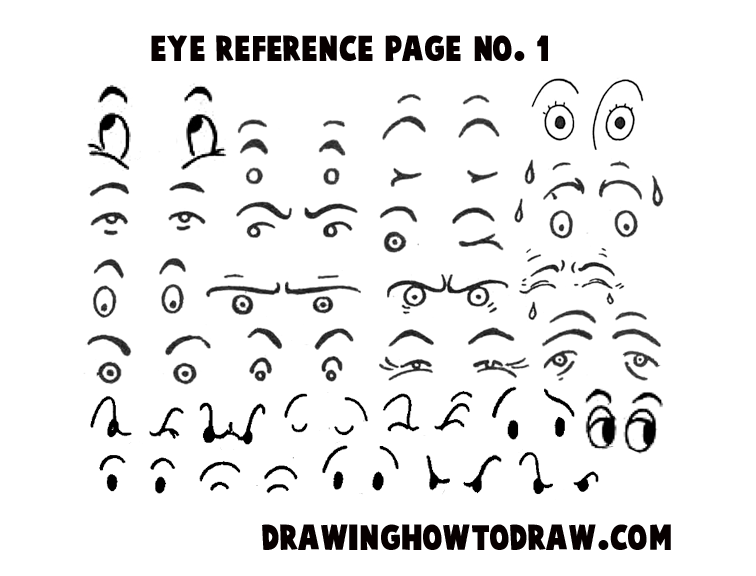 This potentially opens you up to a wider range of emotions for your cartoon face. Decide where you want the eyes to sit. You can position them anywhere on the cross, but it is important to keep a couple of things in mind. The higher the eyes sit, the smaller they might have to be to account for eyebrow and forehead space. Visa versa, the lower they are set, the larger and more dramatic the eyes can be. You will likely want the eyes to be an equal distance from the vertical line of the cross as well as levelly placed on the horizontal line of the cross. Draw a pair of ovals in your face, equidistant from the vertical line of the cross and evenly placed on the horizontal line. Your ovals can have a few different shapes. Straight up-and-down (Note: In this style, you may want your ovals touching on their inner sides right in the middle of the face. 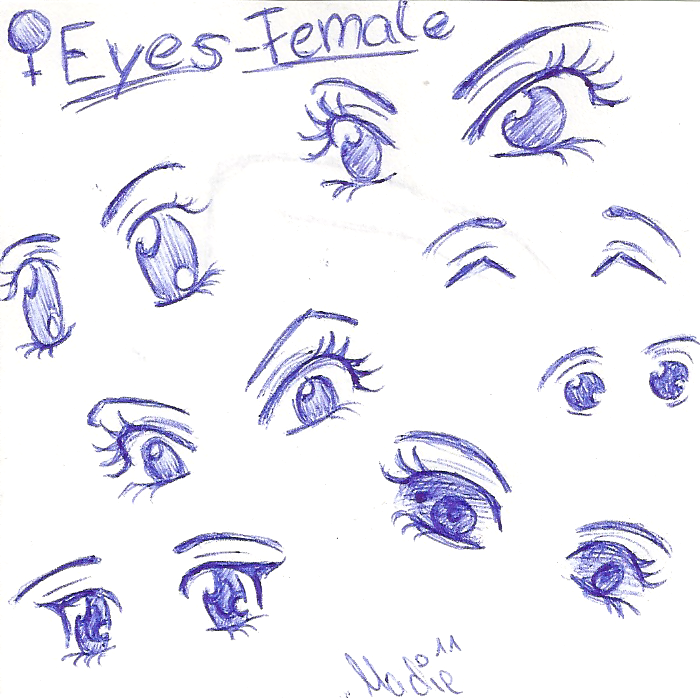 Express your own creativity and ideas as you create your cartoon eyes. There are lots of tutorials and examples, but this is your opportunity to make your creation your own. Unless you are skilled with drawing in fine-tip pen, it is probably best to practice with sharp-pointed pencils. They allow more freedom for erasing and correcting. 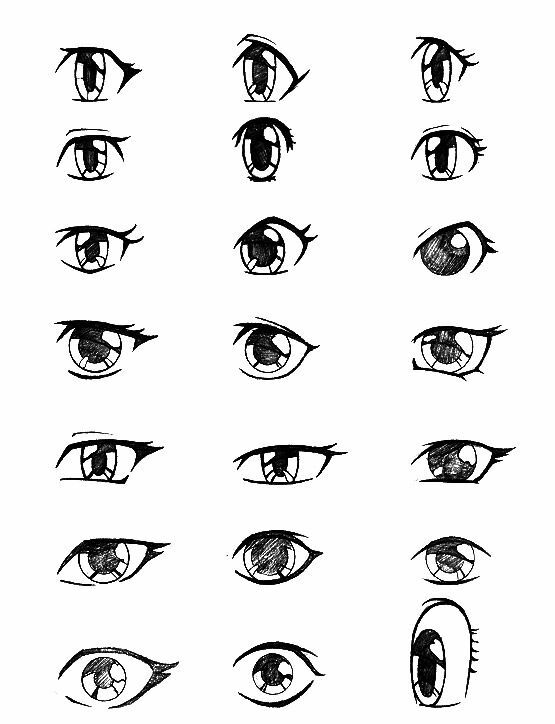 Play around with different eye shapes and styles to find what you enjoy drawing the most. Add eyelashes and eyebrows to the eyes and forehead. It is up to you how you shade in these characteristics, as it will depend on whether your character is male or female. You might want to simply thicken the top line of the eye, with tapers at either end, to indicate eyelashes without drawing wispy lashes. Alternatively, you might want to add a number of eyelashes. 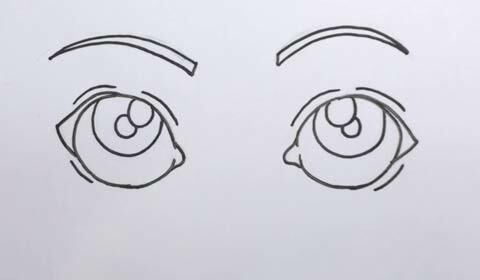 Fewer numbers of eyelashes, or even no eyelashes, are common with circular cartoon eyes. Remember to draw your eyebrows in a shape that helps convey your character’s emotion, as well as to indicate male or female. High arching eyebrows indicate surprise or fright, while lower, less arched eyebrows might indicate boredom or sadness. Decide where to place the eyes on the face. Circular eyes seem to make the most sense being placed evenly apart from each other, as opposed to side-by-side. 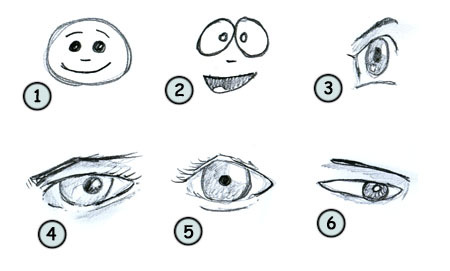 How high or low the eyes sit on the face could help convey an emotion, so take that into consideration as you begin to draw. You will also need to decide how big you want the eyes to be. How much space of the face they take up determines what other features you can add to it. Draw a circle on your sketch paper. It will be helpful to draw a perfect circle using a compass, if one is available to you. Set the width of your compass to a small or medium-sized circle. Place the point of your compass on the sketch paper, and gently place the pencil tip of the compass down on the paper. Pivot the pencil tip around the stationary point of the compass to draw your circle. It may be helpful to lightly hold onto both “legs” of the compass, as the angle can sometimes widen with the pressure of pivoting and drawing. This will help maintain the size of your circle. Design the shape of the cartoon character’s head. Around the baseline of the circle, draw the shape of your character’s head. The shape of the character’s head will inspire you in the type of eyes you give your character. It will also help you determine whether your character is male or female or maybe even an animal or monster! 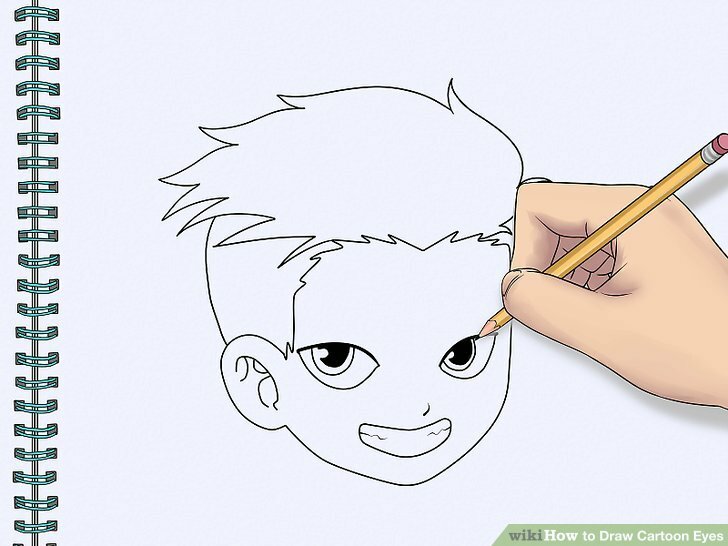 Drawing the shape of the head will include the chin/jawline, ears, and hairline. Thanks to all authors for creating a page that has been read 48,921 times. Draw a pair of circles in your face at an equal distance from the vertical line of the cross. 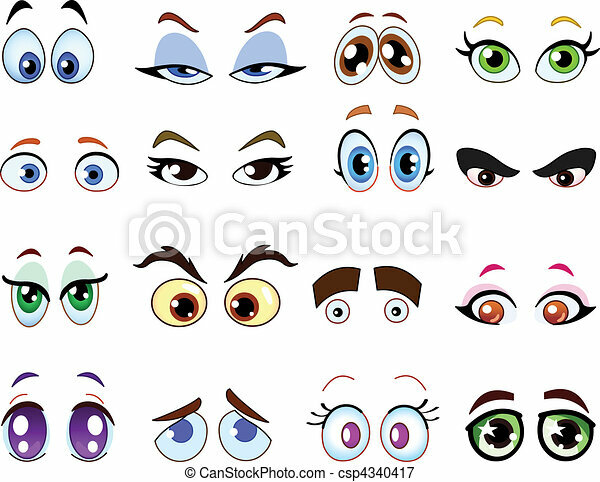 Circles are a great shape for cartoon eyes because humans do not have circular eyes. Use your compass to make these circles. Be sure to adjust the angle of your compass in order to make smaller circles. Make the circles large enough to leave room for pupils inside. Remember that you may need to hold both legs of the compass to avoid your angle widening as you draw the circles.